The Star Hill is a beautiful new, luxurious development located to the south west of the city centre, meaning that the project rests below the majestic peak of beautiful Doi Suthep mountain. Many of the apartments in this project have stunning views of Chiang Mai's most iconic mountain feature. Located less than 2km fr om Chiang Mai International Airport, getting to and from The Star Hill takes just a few minutes by taxi. The project's excellent location means that, from here, you are just a short journey away from the bustling bars and restaurants of the Nimman Road plus the new Maya Shopping Mall. Chiang Mai University is closer still and there are several world-class golf courses also within easy access. The project is a luxurious boutique development consisting of just 204 apartments spread between two low-rise buildings, each of eight floors. Set on a large plot of over 4-rai, there is plenty of space in the project for a wide variety of five-star facilities for guests and residents' usage. In addition to the extensive green areas which cover over 50% of the plot, there is a 25m-long swimming pool in the grounds and other facilities include a fully-equipped fitness centre, sauna, library and games room. On the top floor of The Star Hill is an exclusive Sky Lounge wh ere guests and residents can relax in style while enjoying the beautiful mountain views. Whatever size of apartment you are looking for, you are sure to find one at The Star Hill which meets all of your requirements. All of the apartments here are luxuriously appointed and spacious with even the studio apartments suitable for long-term living as they range in size from 32m2 to 42m2. One-bedroom apartments range from 48m2 to 67m2. Two-bedroom apartments start from affordably-priced units of 69m2, while those looking for larger-sized apartments can opt for sizes up to 129m2. For those looking for the ultimate accommodation in Chiang Mai, there are also stunning duplex penthouses available here with up to four bedrooms/five-bathrooms and 245m2 of internal space. All apartments at The Star Hill are sold on a fully-furnished basis - even including electrical items. There is a choice of two different types of furniture and interior decoration so that your new apartments matches your individual style. 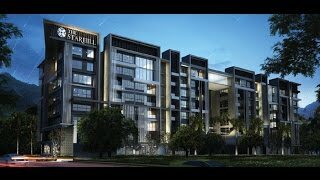 Completed in April 2016, The Star Hill is the perfect choice for anyone looking for a truly-luxurious project which they can move into without having to wait years for an off-plan project to be completed.